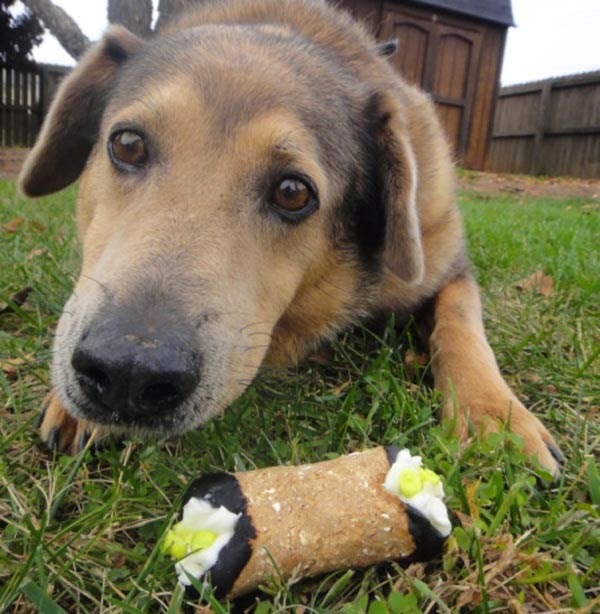 Howl-o-ween is the one night a year you have a chance to be someone (or something!) other than you are. Therefore, Heather decided to rule the jungle as the Lion Queen and Mr. K decided to put on a tuxedo and become a penguin. What do you think? Do they look pretty good as their alter egos or should they stick to the traditional Scottie look? 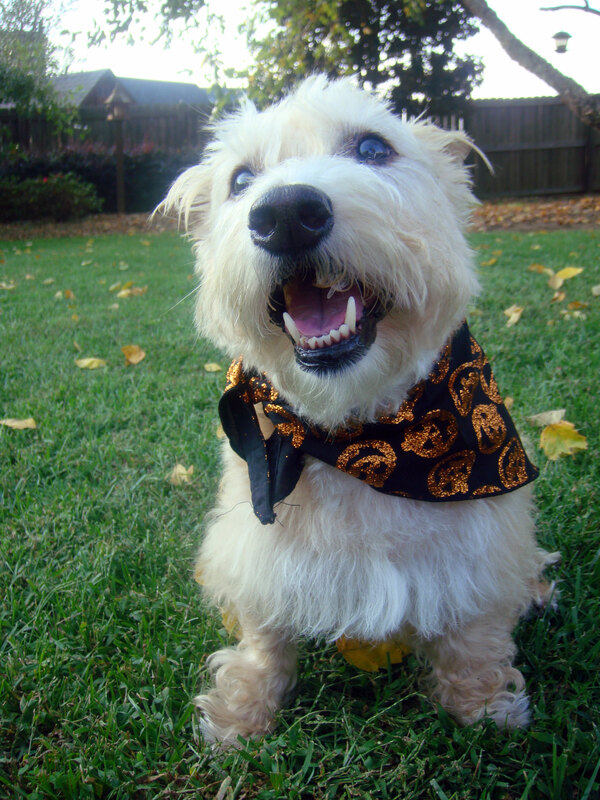 Happy Howl-o-ween, friends - don't get too spooked out there tonight and enjoy those treats! Mr. K certainly won't be saying (or doing) much this BlogPaws' Wordless Wednesday. He's got a birthday hangover! It's been a happening week for Mr. K - full of one birthday celebration after another. Looks like this boy has done too much pawtying and is need of some serious recovery time! Plus, he and Heather have to rest up for their big costume reveal tonight! Stay tuned throughout the day for those photos. Happy Howl-o-ween good friends! You knew it was coming, didn't you? Well, after Heather decided to get all dirty playing in the park Saturday morning, she left this Scottie Mom with absolutely no choice but to give her a bath. Luckily, the place we were going to pick up Heather and Mr. K's birthday cakes also had a do-it-yourself bathing room we were sure to take advantage of upon our arrival. Heather and Mr. K never saw it coming. There they were, walking into a wonderland of treats and toys when, out of nowhere they find themselves surrounded by...don't say it!...baths. Heather was up first, as we certainly had the most work to do on her. These tubs were smaller than the ones I've gotten used to at City Dog Market, so we had to bathe them one at a time. Silly Mr. K probably thought he was getting away free this time, watching Heather get lathered up from across the room. Within a few minutes, though, he learned otherwise. Usually, he doesn't mind baths and I don't even have to hook his collar up to keep him in place. This time, however, he was determined not to take a bath and nearly walked out of the tub twice. The baths met our needs for this particular occasion given that Heather was so very dirty, but I definitely missed a few things other do-it-yourself doggie bathing places have offered. Most importantly, a bath tub that is high enough not to hurt your back while washing two Scottie dogs and easier stairs for the pups to navigate their own way safely in and out of the tub. Other than these minor hiccups, the place was genuinely amazing in terms of the quantity and variety of freshly-made treats. (I even picked up a recipe book for doggie treats authored by one of the owners at Canine Cafe Charlotte - more on that later.) And, rest assured, Heather and Mr. K's birthday celebration was not ruined by our pitt stop for baths, either. 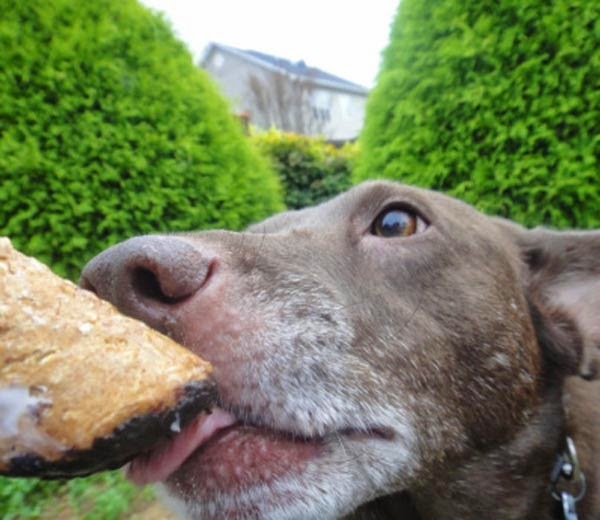 In fact, they were amply rewarded with a number of those delicious looking treats! One of the things I promised the pups for their birthday was a field trip to a surprise location while we visited Heather and Mr. K's Scottie Grandparents. And so, when Saturday morning rolled around, we piled into the car and headed to William Davies Dog Park - rumored to be the very best Charlotte, North Carolina has to offer. Unfortunately, it turned out to be nothing more than a fenced in wooded area, which was a big let down after discovering the adorable Newton Dream Dog Park in Johns Creek, Ga. just a week or so ago. Alas, that did not stop Heather and Mr. K from having fun. Mr. K kept to himself most of the time, perusing the land with Scottie Grandpadre. He wasn't on such good behavior as he was at the last dog park, so he also wasn't priveleged to be off-leash as long as he had been previously. Heather, on the other hand, remained off-leash the entire time, trotting around and finding new piles of leaves to dig through in her quest to find fresh dirt to roll around in. Her hard work paid off as she soon found several spots she could burrow her head into and soak up all the dirt. Much to this Scottie Mom's dismay, Heather went from a cute and clean Scottie to a dirty ragamuffin who, if I'm being completely honest, was still pretty cute despite the dirt and debris in her hair. Oh, how happy she was! Here I am shaking my head one minute and wondering, "what's gotten into her?" The next minute, she's emerging from underneath the bench she was just rolling around under and she looks up at you with this wild grin as if to say, "LOOK!" 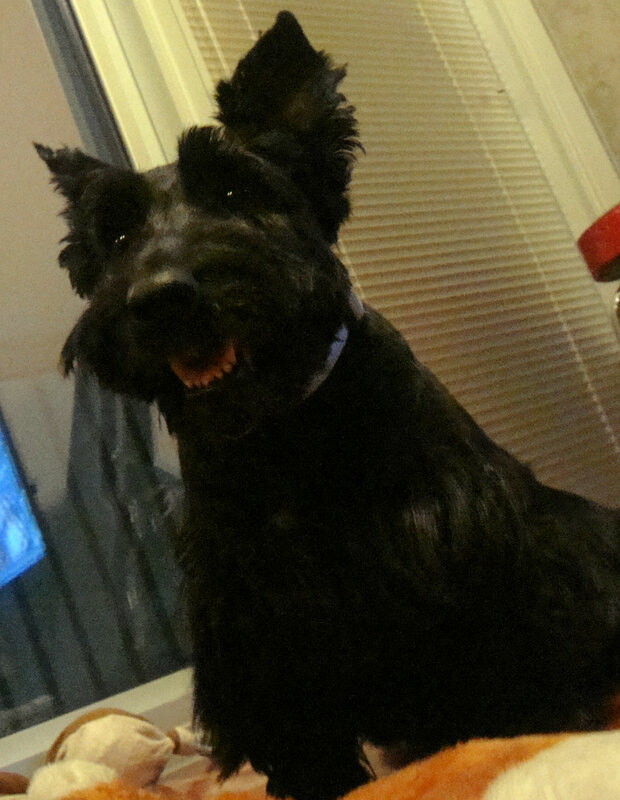 No matter how dirty the Scottie, who could be upset at anyone with a face like that? Then, as if to answer that rhetorical question, Heather begins to shake off the dirt she accumulated in her hair, a cloud of dust quickly forming around both her and the people around her. That surely was no fun, at least for me. Apparently, it was great for Heather as she began the whole process of getting dirty and shaking it off a second and even a third time before it was time to leave. Silly little girl must have thought that because it was her birthday weekend, she would be exempt from a bath...if only she had known better! Do you think she would have gone through with it anyway? Remember the EASY-BAKE Oven, the "learn how to bake but not really" toy for girls? This Scottie Mom had one growing up and I really haven't developed my baking skills since that time, believe it or not. That is, until now. Apparently there's a new bake kit in town that seems to operate on Scottie Mom's very basic cooking skills level. The best part? (Besides the fact that the kit is decorated with a Scottie and red/black plaid!) It's a bake kit for dog treats so I'm sure my taste-testing audience will be very generous with their feedback! I owe this latest Scottie-decorated find to Heather and Mr. K's Scottie Grandmadre. 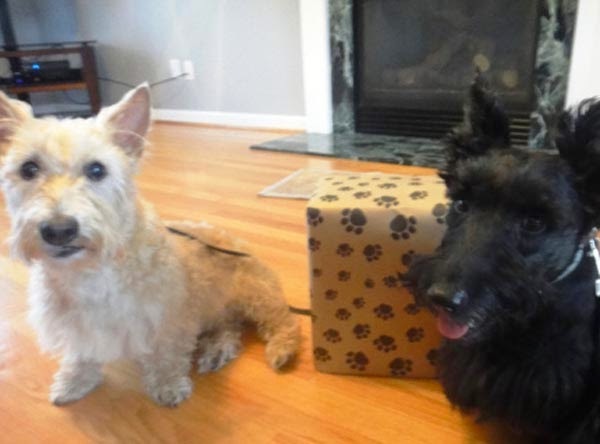 Once again, she has managed to defy expectations and come up with a pawesome Scottie gift. This time, one that is sure to keep giving (assuming Scottie Mom learns how to properly bake some tasty treats and doesn't get too frustrated with the biscuit maker!). And while Heather and Mr. K were a little unsure of the wrapped box when they first saw it, I'm sure it won't take more than once or twice for them to realize what the treat kit looks and sounds like - meaning, there won't be any surprising these two once they make the connection that the box with a fellow Scottie on it means the infamous "T" word (and hopefully, tasty ones at that!). The bake kit for dog treats comes with an electric cooking appliance that reminds me of a George Foreman grill and boasts the ability to cook up your doggie's treats in minutes. Several cookie cutters and suggested recipes also come in the kit as well. My favorite part of the kit, by far, is the use of the Scottie as the logo on the tin that holds everything and also on the biscuit maker itself. What Scottie Mom wouldn't love that? My judgement (as well as Heather and Mr. K's) on the rest of the kit and how well it bakes will come down later this week, more than likely, after I have a moment to get over the fact I'll be baking a batch of cookies for my beloved Scotties before I even attempt to make one for myself and Scottie Dad! A birthday just isn't official until you have a piece of cake (and eat it, too!). And what better way to eat your cake than in the company of close family and friends? Heather and Mr. K invited Cousin Snackle and Cousin Circe to join them for an afternoon celebration and happily, they obliged. After taking some family photos to commemorate the event, each of the pups dug into a special treat from Canine Cafe Charlotte (more from our visit there coming to the Scottie Mom blog in a few days). Cousins Snackle and Circe had fresh-baked cannolis while Heather and Mr. K chowed down on some cake. Needless to say, it was a yummy-licous pawty! 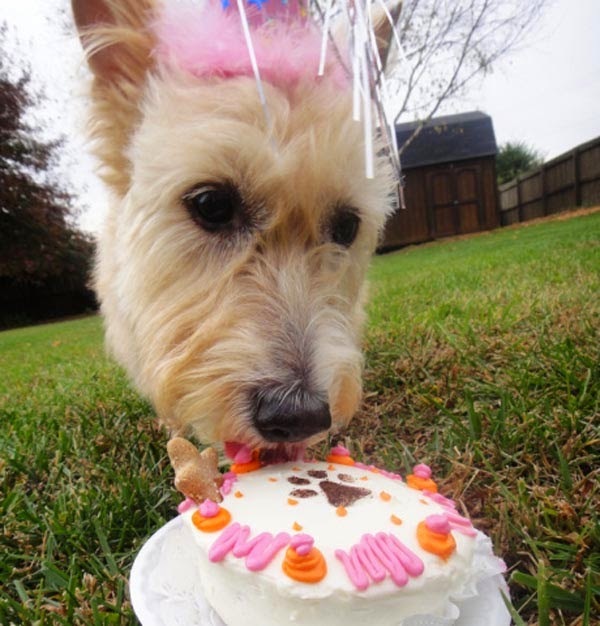 To watch videos of Heather and Mr. K digging into their birthday cakes, check out the Scottie Mom facebook page. What can I say? Being eight is great! Scottie Mom took the whole day off of work today to bring us to our Scottie Grandmadre's house in North Carolina. 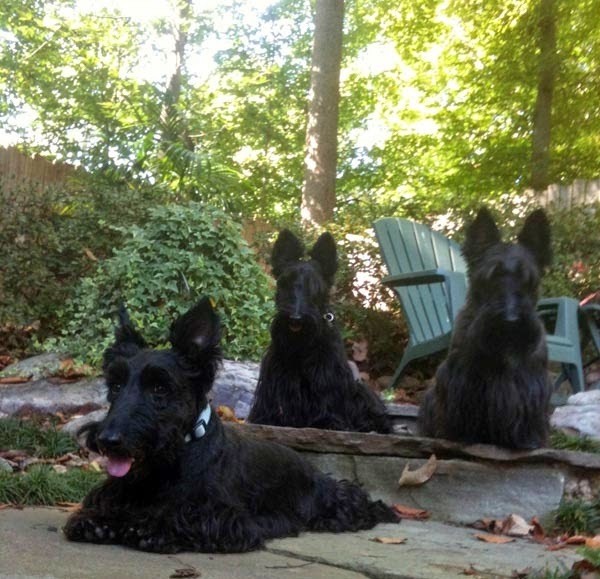 Let me tell you - it is Scottie heaven here. Lots of belly rubs, back pats and lovin' whenever I want it. (It's because Scottie Grandmadre likes me best but, shh...don't tell Mr. K - he'd be so upset if he knew!) I wish you all were here to play and celebrate with me. The grass is absolutely amazing. I haven't stopped rolling around in it since I got here - I even ate a few pieces of it but I don't think Scottie Mom noticed so please don't tell on me! Ok, friends, I have to cut this note short tonight. I have a lot more beauty rest to catch up on. 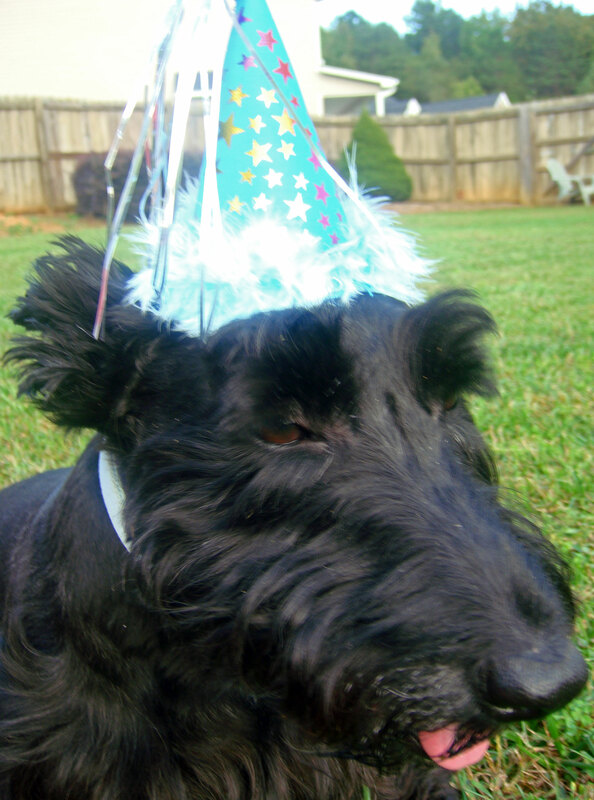 Scottie Mom says we'll be having a birthday pawty this weekend and I must be looking my best. You never know who might show up! Also, rumor has it that Scottie Grandmadre got me a gift she couldn't wait until Christmas to give me so I'm getting it early. I wonder what it is? Something tells me it's my own pet squirrel. Anyway, many thanks again for the birthday wishes. You guys are the greatest friends ever! Watch out for photos from our adventures tomorrow. I'll be thinking of each of you and wishing you were here! 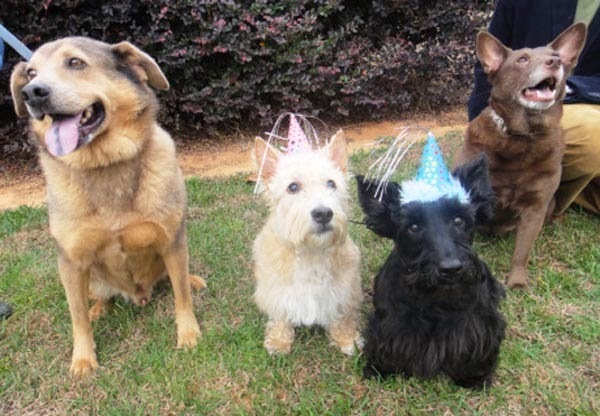 Better put on those birthday hats and pawty pants, Heather and Mr. K - it's time to celebrate! 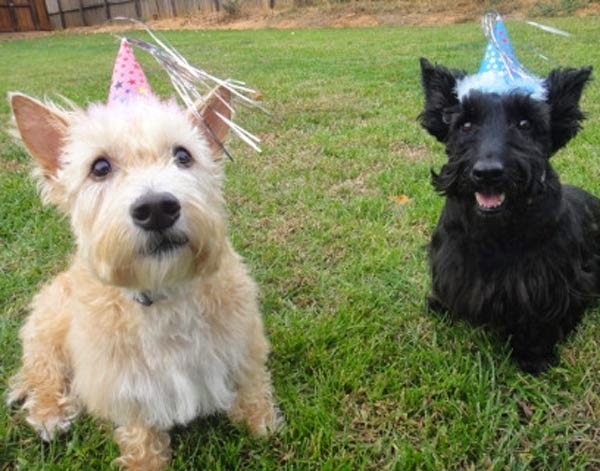 In honor of another fabulous year gone by (and a tough one for both my Scottie pups, at that! ), we're going all out and sparing no expense. We'll start with a yummy moist food dinner Thursday (their actual birthday), a treat or two and a road trip to visit Scottie Grandmadre on Friday, a field trip to a surprise location on Saturday and wrap up the weekend of celebration with a birthday pawty with some extra special friends and gifts on Sunday! As both Mr. K and Heather are rescues, we'll never know the exact date each was born, so we celebrate on October 25 jointly. Ironically, our vets have estimated them to both be born sometime in October, just two years apart. This year, Miss Heather is turning eight years old and Mr. K is turning six. My, how my children have grown! Mr. K was a mere 3.5 years old when I adopted him from PETS, Inc.! And, given the health challenges we've faced together this year, we have every reason to celebrate their birthdays and give a toast to the little Scotties! 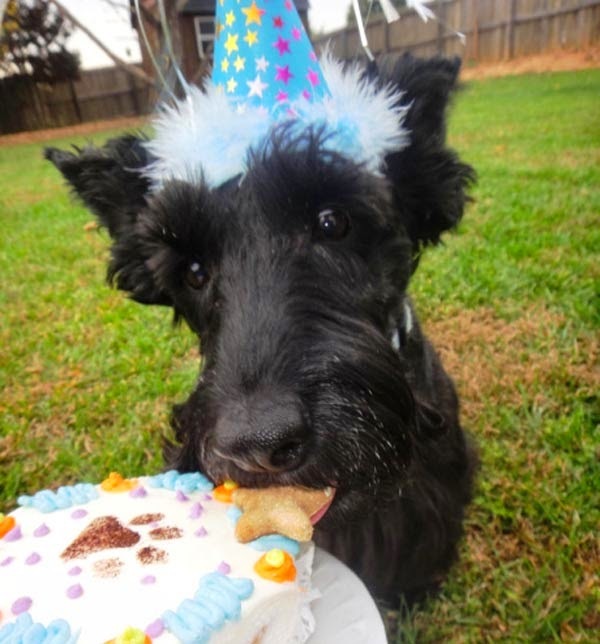 Happy Birthday, my sweet Scottie loves! May your day be the best you've had yet!! Mr. K couldn't hold out on the Halloween treats any longer and snuck one for himself. Sneaky puppy! And there he is laughing over his latest conquest. He claims it was all good fun in the name of the Halloween holiday spirit to give our BlogPaws' Wordless Wednesday friends a good laugh. Now, Mr. K is a playful guy who loves to pull pranks but when asked to choose trick or treat, he threw his old bag of tricks out the window. What would your canine choose: Trick or Treat? 1. Like my brother's costume, mine isn't that different from the color of my beautiful coat. 2. I don't have much in common with my character...except for the occasional growl and our mutual love of cat...I mean, dog!...naps. 3. The only way I could be as fast as my character is if a squirrel appears within my sight. ZOOM! 4. Technically, I'm cross-dressing for Halloween. You see, only boy characters wear the pretty headdress I get to wear with my costume. If I wanted to be the girl version of my character, I wouldn't have to do much...except grow at least five times my size and have rounded ears. 5. Neither me or my character is wasteful when it comes to food. We eat everything that there is and we eat it all at once, leaving nothing untouched. 6. My character and his entire family are the stars of a really good Disney movie. 7. The character I'm dressing up as was the subject of a No. 1 hit song in the U.S. during the 1960s made famous by a doo-wop group. Tonight, we remember Mr. K's squeaky toy...for it was no ordinary squeaky toy. No, this squeaky toy was a very special one which brought lots of tail wagging time to Mr. K and hours of high-pitched noises to keep Scottie Mom and Dad alert. (Music to our ears, let me tell you...) Equipped with not one, not two, not three or four or even five but 19 squeakers, Mr. K's super squeaky toy is finally being laid to rest a mere four months after being brought into the Scottie Mom household. It was a slow death for the super squeaky toy. The first of the 19 squeakers was punctured within a day or two of bringing the toy home. A month or so later, we were pleased to find four squeakers remained intact. We knew trouble was on the horizon for the dear super squeaky toy when Mr. K began performing surgery on the toy, extricating a broken squeaker here and there. Finally, there were only two damaged squeakers left and with as many surgery scars and puncture wounds as the poor toy had, the answer became increasingly obvious: the super squeaky toy had met its end. And so, we lay the super squeaky toy to rest and commend it for the hero it is, having spent the four short months of its life being hunted, tugged on and ripped to pieces by a ferocious Scottie at play. Rest in peace, super squeaky toy. You certainly will be mourned and missed by Mr. K...if only for a day or so. 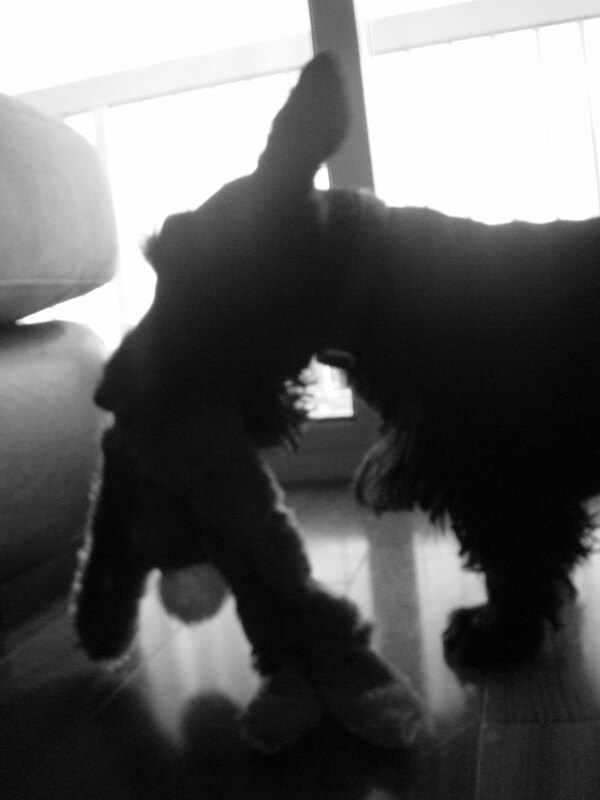 After all, a Scottie's gotta play when a Scottie's gotta play. If there is anything in the world Mr. K loves more than attention, it's treats. That's probably the reason he has initiated a countdown to the holiday of treat-seeking. Tonight, he reveals a few clues about the super cool costume he's convinced will score him all the attention and the treats in the world next Wednesday. See if you can guess what (or who!) Mr. K will be this Halloween. 1. The color of my costume really isn't very different from the color of my coat. 2. Both me and the character I'm portraying are very distinctive in the ways we walk. 3. There is a brand of clothing using both the name of my character and his portrait as a logo. 4. Consequently, it is safe to say my character is always formally dressed "to the nines." 5. We both enjoy chilly weather...although my character probably prefers it more than I do. 6. I stand on four legs. He stands on two. 7. If he were to race against Olympic swimmer Michael Phelps, my character would win. Another day, another milestone for Heather and Mr. K. Today, we visited Newton Dream Dog Park in Johns Creek, Georgia. Building on last weekend's success with their new friends Syd and Oz, Scottie Dad and I decided to allow the pups into a dog park (as opposed to simply gazing in from the outside) for the first time since I first brought Mr. K home from the shelter 2.5 years ago. Immediately after walking in, Mr. K and Heather were greeted by at least a half dozen new friends in the small dog park, including a one-year-old Scottie (who was simply adorable!) and a Westie. Historically, Mr. K has never been good with his distant cousin Westies but today was the beginning of a new era for Mr. K. Wouldn't you know he never once let out a warning growl? He was so busy checking out the scene and chasing tennis balls that he seemed to forget he once had a 'thing' against small, white dogs. What he didn't forget, however, was how badly he wanted to hang with the big dogs. He spent a lot of our time there near the fence looking over to the big dog park and occasionally whining he wasn't able to partake in the big dog fun. Surprisingly, it was Heather who underwhelmed today. She was let off-leash as soon as we got inside the park and was her usual sweet, innocent and happy self for most of the trip. She did let out two warning growls to a Jack Russell who kept hanging around (who also returned the favor right back at Heather!). Other than that, both my babies behaved beautifully and I cannot believe Mr. K did such a great job that Scottie Dad and I even allowed him off-leash. That's twice in one week! Keep up the good behavior, Mr. K - you're bound to make a lot more friends this way! Hello, friends! Heather here. I've stolen the blog from Scottie Mom tonight to answer a few questions from my some of my favorite Scottie people (which is ALL Scottie people, really). Feel free to keep the questions coming - you all know by now I love a little extra attention! Recently, Plutonio's Scottie Mom asked: I would like to know if your character changed radically when you turned one year old. 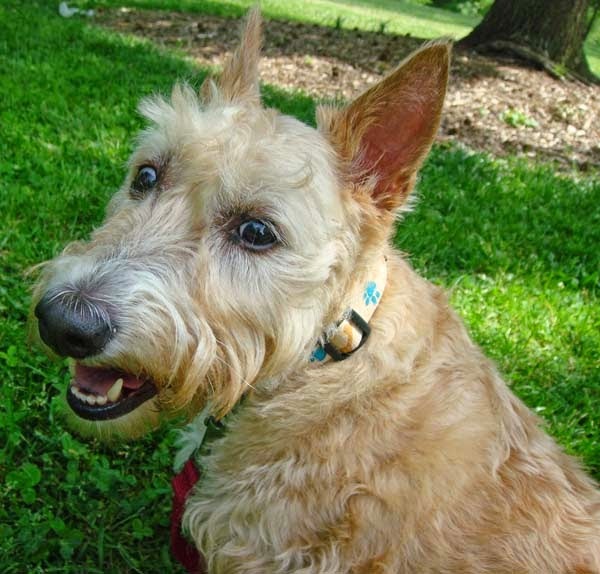 Do you think male Scotties are more possessive than female ones? And what should this Scottie Mom do with unpredictable temper and reactions in a Scottish Terrier? Phew. That's a lot of questions, Plutonio's Scottie Mom! You bet my character has changed over the years, although my Scottie Mom will never know the full extent to which I have changed since she adopted me when I was 6.5 years old. When I was just a little ball of fur, I loved to frolic and play without a care in the world like any other puppy. But my time on the street taught me to toughen up. Now, I don't take any nonsense from any dogs. Do I think boy Scotties are more possessive than girl Scotties like me? Possessive, no. Protective, yes. Let me explain. You see, Mr. K will give up a toy and even a treat occasionally without so much as a growl but along comes another dog when me and Scottie Mom are out walking with him and the boy goes bizerk! I can't tell you how many times he tells other dogs to stay away, that we are his to look after and take care of. It's cute, to an extent, but completely unnecessary. Scottie Mom and I are the independent women type. We can handle ourselves just fine. Now, in response to your question about what to do with unpredictable temper and reactions from a Scottie dog...my Scottie Dad really is the best one for these kinds of situations. If I misbehave (which is pretty rare, I must admit), all Scottie Dad has to do is say my name in a certain tone and I know I've displeased him. Mr. K, on the other hand, requires a little more discipline. My Scottie Dad or Mom have to tell him to stop, then they tell him to sit and, if he doesn't listen, they push on his bottom gently until he sits and calms all that Scottie-tude down. Fellow Scottie Hootman asked: Do you like cheese? You bet I do! I don't get it very often, only sometimes when we have to take some medicine and we're all out of those wonderful chicken flavored Greenie's pill pockets. Truthfully, though, I'm not a picky eater, Hootman. Seriously. I learned from my experiences before I found my furever home that meals (and good ones at that) aren't always guaranteed and so, if my Scottie Mom and Dad aren't careful with the things they leave behind, I might nab them and try to take a bite out of them...you know, just in case something happens and that next meal doesn't come. Scottie Mom gets real upset when Scottie Dad forgets to shut the door and I get an all-access pass to the trash can. She tells me it is gross and that she feeds me way better stuff (True!) but I always say it is better to be a safe Scottie than a sorry Scottie - and I'm not going to miss out on an opportunity to ensure I have my next meal! 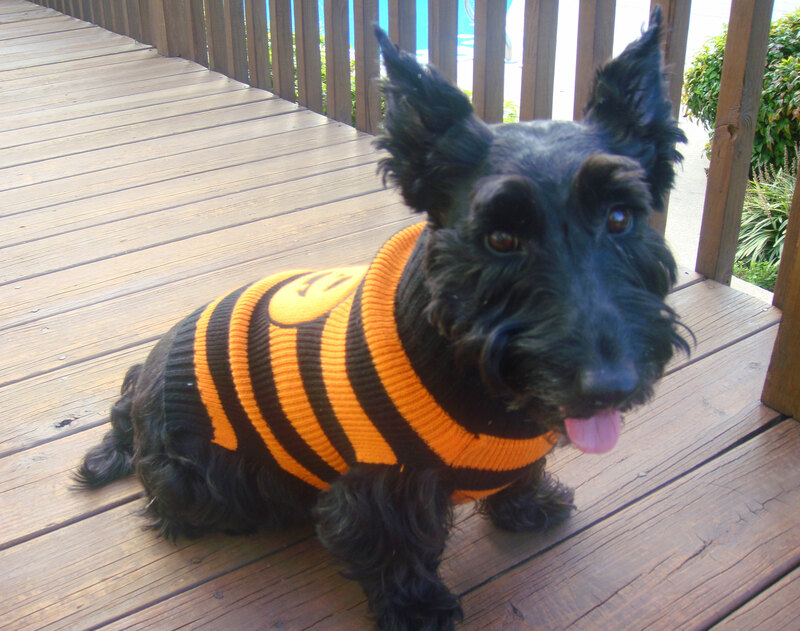 Indy and Maggie's Scottie Mom asked: What are you going to be for Halloween? Well, my Scottie Mom said I wasn't allowed to tell anyone what my super cool costume was for Halloween. But I can tell you this: it is adorable and I promise you'll like it! This is the first Halloween Scottie Mom has dressed up either myself or Mr. K and I think she did a good job picking out the outfits. I just tried mine on yesterday for the first time...Scottie Dad even said he liked it, too. Ok, I know - I'm driving you crazy by not telling you and truthfully, I don't think my Scotte Mom is being fair about this so I'll give you a hint if you promise not to tell: ROARRR! Now that I've had a chance to answer some of your questions, I'd like to ask a few of my new friends so I start getting to know each and every one of you like you know me! 1. What are all my canine friends dressing up as for Halloween? 2. Who thinks they have the most spooktacular costume of all? Ok, so I know BlogPaws' Wordless Wednesday is about posting photos on your blog that require no explanation but I feel like today's photo of Heather acting all silly requires one. The only problem is: I don't have one! Maybe she's trying to run upside down? Feel a little taller by stretching out? Play dead? Catch a tan on her belly? What do you think inspired Heather to strike this pose for the camera? The first time I visited the Happy Dog Cafe in Belmont, N.C., I was enchanted by their cute fall doggie clothing and freshly-made treats when I suddenly felt a tap on my shoulder. As I turned around, my dad pointed just across the store. I followed his gaze and what did I see? Not one but TWO precious Scotties shopping with their Scottie Moms! Immediately, we struck up a conversation about our Scottie kids and I got to pet the pups, now feeling guilty I hadn't brought mine to the store that day. 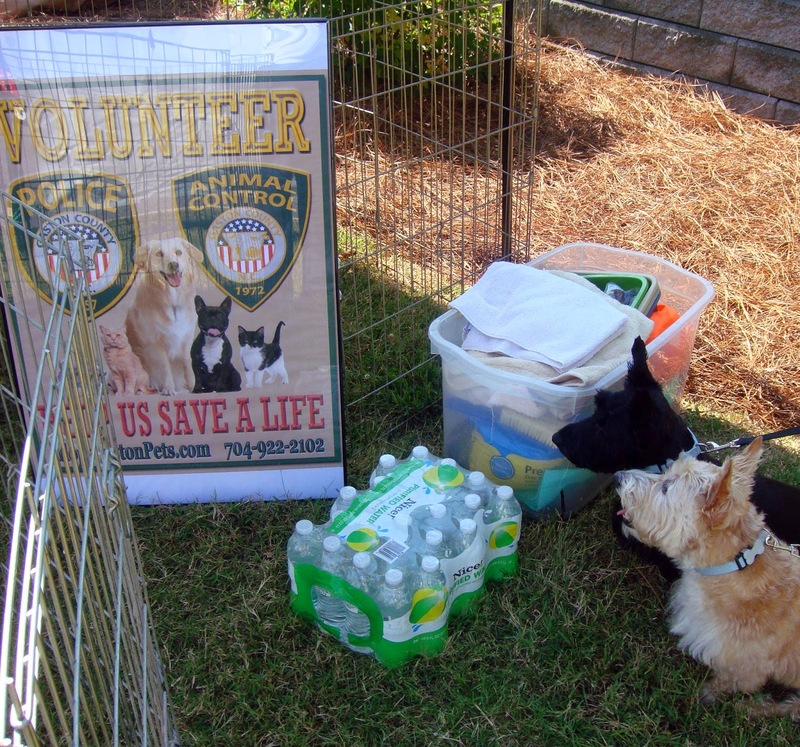 Turns out, one of the ladies I met works with the Scottish Terrier Rescue of the Carolinas. So, with the fall season already in full swing, I figured it was time to pay another visit to the Happy Dog Cafe on our last trip to North Carolina in the hopes to discover more cute clothing and perhaps have another Scottie encounter (especially since I no longer remember the rescue volunteer's name). Unfortunately, we didn't see any Scotties this time nor did we really find any cute outfits for Heather and Mr. K. We did, however, score some super cute candy corn- shaped treats and a little special something for their upcoming birthdays (but shhh, don't tell - you'll see what I got soon enough!). 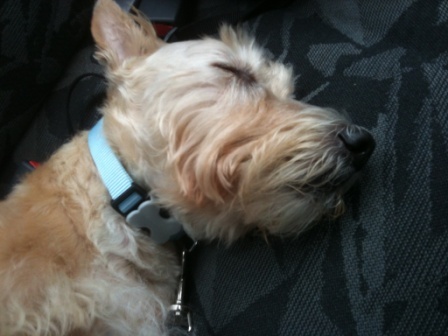 Heather sporting her new collar shortly after being adopted in April 2011. People often ask me: how did you know Heather was going to be the right companion for Mr. K? Truth be told, I relied fully on faith that it would all work out and patience. 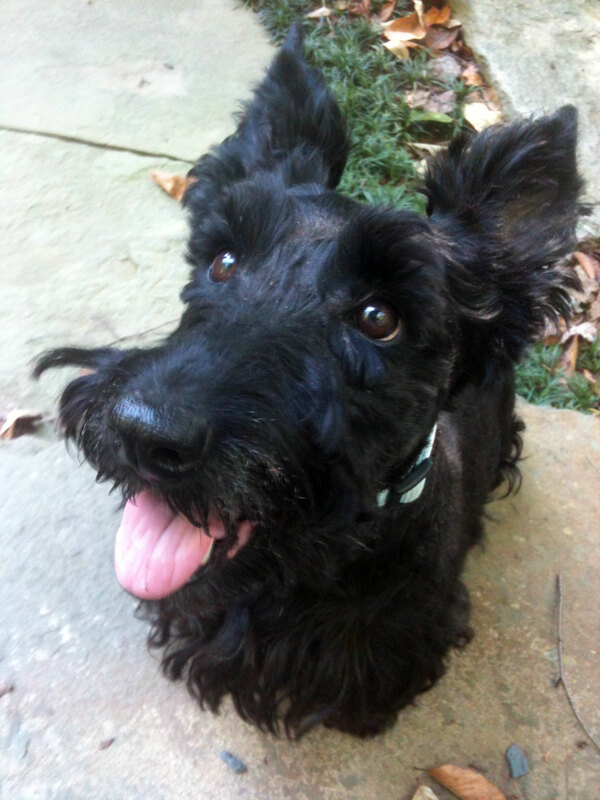 I had known for months I wanted another dog to keep Mr. K company while I was at work but had yet to find one that I got that feeling telling me I'd found the right furever friend for Mr. K. Then, I saw Heather online and started making some calls to the Tennessee Scottie Rescue. When the time came and Mr. K and I went to go meet Heather, I was highly encouraged by the fact they simply ignored each other. I thought to myself, "Okay - that's a start." I don't think Heather had been with Mr. K and I for more than a day or two and I just knew she wasn't going anywhere anytime soon. I took her shopping to get her some things to make her feel comfortable in her new home (because that's the first thing any Scottie Mom would do, right?!). Mostly, I knew I had to get her a bed of her own - she kept stealing Mr. K's (although I can't say he minded...that just meant more time in the hooman bed). It was at the store when I looked down and saw that happy face that I realized I may have already bought her a little something of her own about a year prior to her coming, without knowing it was for her: a very fashionable collar. Back up a bit to April 2010. I'm taking Mr. K from the shelter for our "at-home trial." I spend what seems like eternity trying to pick out the perfect collar and leash. The toys were the easy part - even the shelter staff knew Mr. K could never turn down a squeaky tennis ball. But the collar gave me the most trouble. In the end, I chose two: one a deep purple, green and brown paisley pattern and the other a fun, light creme collar with paw prints. When I got home, I loved the paisley printed collar so much I didn't even want to try the other one - which is good, really, since the other collar was simply too big for Mr. K no matter how many times I adjusted it. I'm not sure why - other than perhaps pure laziness - but I never got rid of the paw printed collar. And so, a year later when Heather and I were at the store checking out at the register, it dawned on me that the paw print collar could be the perfect fit for Heather - both in terms of fit and fashion. Sure enough, we got home, greeted Mr. K and pulled out the collar I had pretty much given up on for good. One small adjustment and a click around her neck and I knew I had bought that collar for a reason. All her troubles for her previous life as a street dog aside, my Miss Heather had herself a true Cinderella story now...after all, the collar fit. Which gets me to thinking: not long ago, I decided to change out their collars so Heather and Mr. K could have matching ones (not to mention Mr. K's beautiful paisley one had all but fallen apart). In the process, I narrowed the collars down between two patterns and could not decide between the two so I got both: a pair of pastel blue collars and a pair of grey argyle printed collars (which they currently sport). Call me crazy but could it be that fate is telling me another pair of Scottie rescues might find their way into this Scottie Mom's family in the near future? After a month of being ousted from the spotlight by darling Heather, Mr. K insisted that this week's one-on-one time be all his. As always, be prepared for a little Scottie-tude, my friends. I'm afraid nothing will subdue this boy's spirited nature...except for a few belly rubs, of course. Hello again, Mr. K. It's been a while since we've sat down for a chat. Yeah, tell me about it. Heather's been stealing all the attention lately. You think that's because she's a girl? Or, do you think she's just that good at winning people over? Think about it, Mom - I'm just as cute, you know. Plus, I do A LOT of funny things to make everyone laugh. You certainly do and I'm sure you have just as many fans. But, let's not dwell on that. What would you like to talk about? My new friends Syd and Oz. They're the best! And they've got a great home with a backyard full of things to explore. We could have stayed out there having all sorts of adventures forever. I don't know why everyone laughed at me when I went upstairs with Syd and Oz for bedtime. I was only trying to buy us more time. Plus, we're good friends now. Aren't we supposed to do everything together? Besides, I'm pretty sure they didn't want us to leave, either. Why'd we have to go, Mom? It was time for dinner. Would you rather have stayed than have had a yummy dinner? Heavens, no. Food is always good. But Syd and Oz have food...and toys. And a yard. And lots of room to run zoomies. 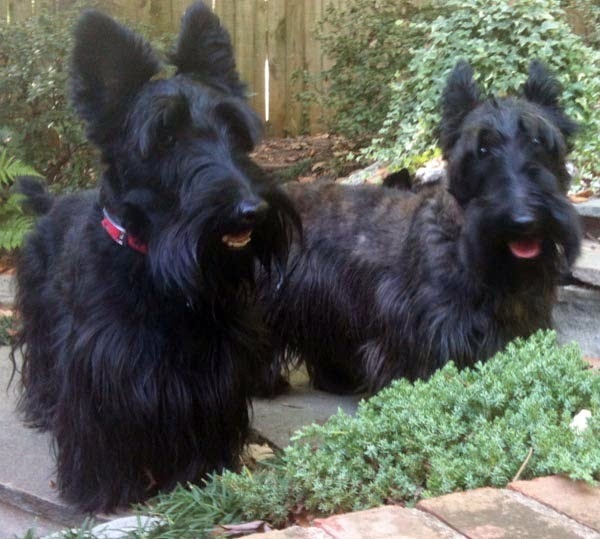 Oh yeah, and their Scottie Mom and Dad are pretty cool, too. That's true. I just figured you would want another opportunity to steal Scottie Dad's spot on the bed while he's away again. Oh. Good thinking! Yes, now I understand why we had to leave. Anything for some extra time on the hooman bed! Mom, aren't you afraid Scottie Dad is going to catch on? I don't know what you mean. Catch on to what? Ohhh, I get it. We're playing it cool. I can do that. After all, I bet he thinks these conversations are pretend, doesn't he? Wink, wink. Silly Scottie Dad. Man, he really missed out yesterday, didn't he? I bet he would have laughed so hard when he saw me dive right into the little pond Syd and Oz have. That water was so refreshing! I didn't realize there were some sleeping fish there, though - hope I didn't scare them too bad....come to think of it, Scottie Dad missed the last time I jumped in the water as well. Man! He'll never be able to watch me show of my Scottie skills. Ohh, I think he's seen some of your skills already, little one. Tell me, now that you've made new Scottie friends, what's in store for the future? Well, I think we should start by attending Fala Day in November. I hear lots more Scotties will be there and I'm anxious to meet them and see if they like me as much as Syd and Oz did. Then, I think you, me, Heather and Scottie Dad ought to take a vacation. Maybe to Savannah. Or, better yet, perhaps we can go check out Asheville the next time we visit Scottie Grandmadre. There's so much more to the world we have yet to see! And I'm hoping we'll uncover more Scotties like me along the way. 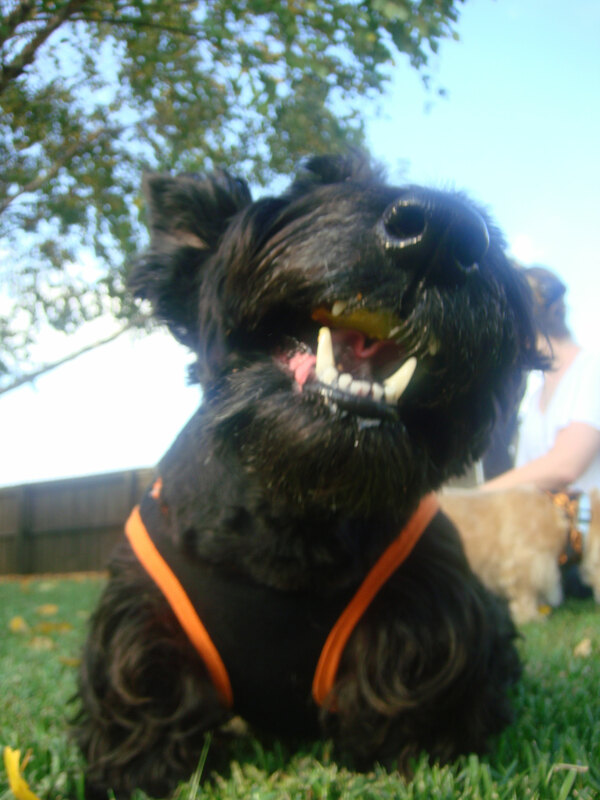 Can you believe all the Scotties we've met through Project: International Scottie Love? 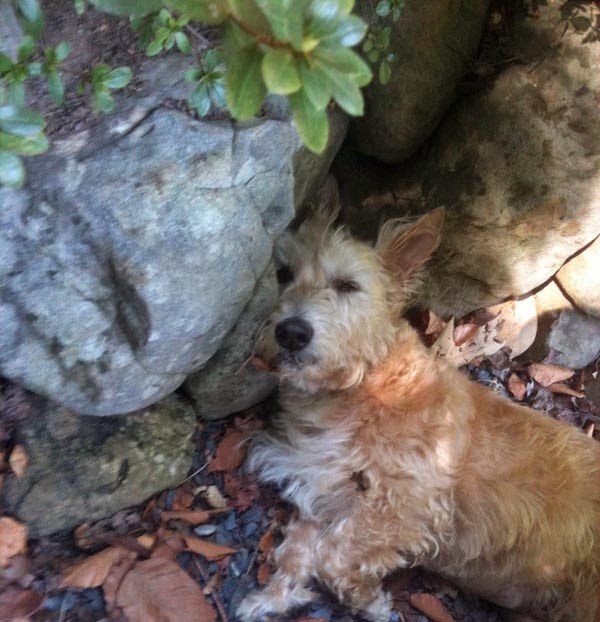 I'd like to go out west and meet Pippen and Jacque in Portland, Oregon. Maybe they can show me why their hometown comes so highly recommended for hoomans with dogs. We could make a Scottie road trip out of it! Maybe some day, Mr. K - speaking of which, are you sticking with Scotland for the Project: International Scottie Love win? Of course. I wouldn't want it any other way. Although, they have a lot of catching up to do with South Africa and Peru. My paw's still on one of the southern states to take the Stateside Scotties win as well. Alright. I guess we'll just have to see how it plays out. Any last words before we join Miss Heather and turn in for the night? Yes. First, thank you for allowing me back in the spotlight. It's been very fun and I hope to have another opportunity soon. Dear Scottie friends and fans - that's where I need your help. Right now, Heather still has a few questions lined up for her next interview. Mom says if I get more than five questions this time that I can have the Scottie spotlight again next weekend since I've been out of the spotlight so long. So, ask away and have a good night! Sorry Heather, this is the boys' club! That's OK...I plan on napping here all day. Following the leader wherever he may go. 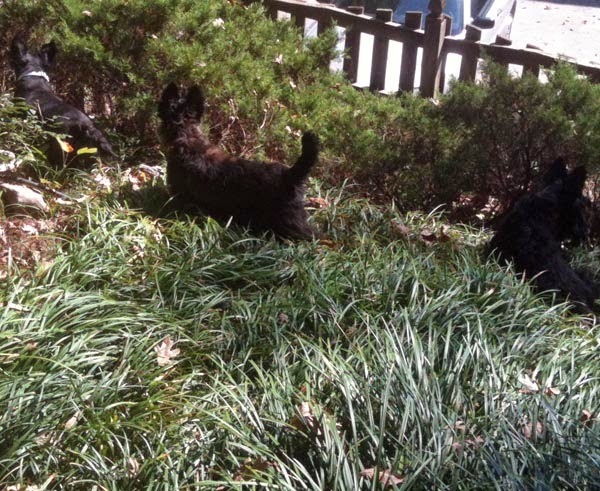 Today, we arranged to have a Scottie play date in the hopes Heather and Mr. K could make new friends. I was nervous with Scottie Dad not around and taking into consideration Heather and Mr. K's history of unfriendly behavior but it was clear within just a few minutes that fellow Scotties Syd and Oz had passed the test. Even better, I'm pretty sure Mr. K made some friends for life! Syd and Oz are the most light-hearted of spirits and it was so cute to see them trot along with Mr. K whether it was chasing after a toy, keeping an eye out on the perimeter or protecting the grounds from foreign barks that found their way into the backyard, which truly is landscaped with a Scottie in mind - I'm not sure Mr. K would ever get bored exploring his new friends' backyard. The three handsome men quickly formed their own little pack - a boys' club, per se - and set off for an afternoon of adventure. Heather, on the other hand, really didn't seem to mind. In fact, she was the one who warned Syd and Oz from the start that she was not to be bothered and that she would be the one in charge. After a few quick sniffs here and there as well as rewarding herself with some back scratching using the chair to rub her bottom against, Heather found her Scottie Spot in our new friends' yard and remained there, only to reappear when the magical "T" word was heard. And once those treats were revealed, you bet she stayed around to collect some yummy treats and lots more back scratches! Many thanks to Syd and Oz for being such great hosts to my pups and of course to Syd and Oz's Scottie Mom and Dad for having us over for this afternoon of fun! Heather and Mr. K have been fast asleep since we got home (but not before chowing down on their much-anticipated dinner!). Looks like this Scottie Mom can sneak off to bed a bit early! I've found plenty of cute Halloween-themed clothing for the Scotties to sport out and about, and while I'm pretty sure they'd collect a fortune's worth of treats if they went trick-or-treating dressed like this, I'd still like to give Heather and Mr.K a chance to feel what it is like to be something 0ther than a Scottie, if only for one night. And so, with this being the first year I dress the Scotties in costume for Halloween, I want to make sure I do it right. Therefore, I must solicit your help: if you could dress Heather and Mr. K in any costume this Halloween, what would you choose? October is National Rescue a Shelter Dog Month. You know what that means? Go find some rescue Scotties (and non-Scotties), people! If I had the ultimate powers of persuasion and could convince Scottie Dad to let me bring in two more rescue Scotties, I would without a second's hesitation. This past weekend, in honor of National Rescue a Shelter Dog Month, I took Heather and Mr. K to an adoption event in Gastonia, N.C. at a local car dealership to see what kind of attention these two cuties could drum up for their fellow furry friends still looking for good homes. There were only a few furry friends from Gaston County Animal Control who came out on this relatively warm Saturday looking for their new home. Heather and Mr. K said hello to Scottie Mom's sister, who volunteers for Gaston County Animal Control, and then sat to watch their new friends come out one by one. Years ago, back when I was in high school, Gaston County Animal Control had one of the highest kill rates in the nation. From what I understand, the shelter remains extremely full today. Thankfully, the shelter has since been blessed with a few angels like my sister but until North Carolina passes stricter spay/neuter laws, I'm afraid the problem will never really be solved. So far, my sister has found three Scotties who have turned up at this kill shelter so whoever said pure breds don't end up in shelters is clearly mistaken. (Obviously, because I found Mr. K at a shelter.) 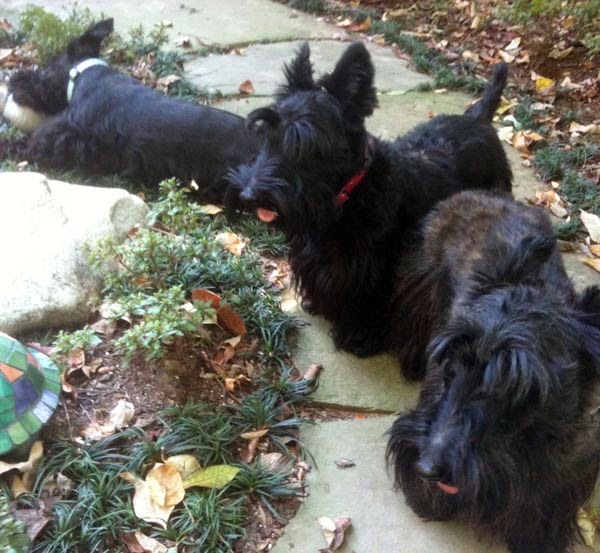 Luckily, my sister notifies me anytime a Scottie turns up and I immediately reach out to my friends at the Tennessee Scottie Rescue and the Scottie Rescue of the Carolinas. 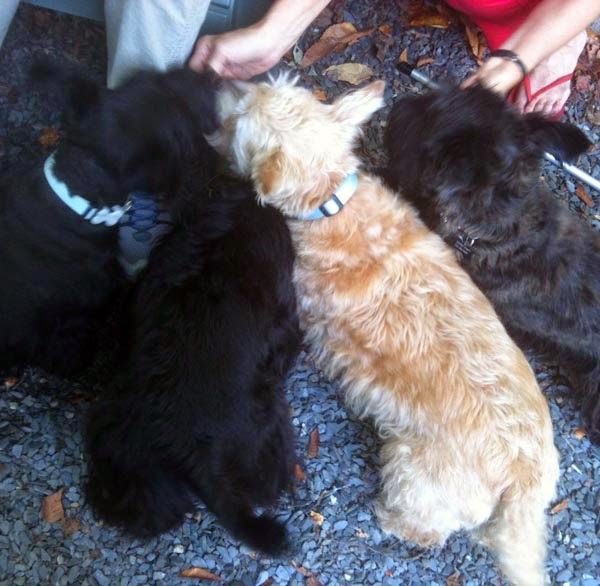 All three Scotties were picked up by rescue groups and I am confident they are safe and hopefully in loving homes by now. 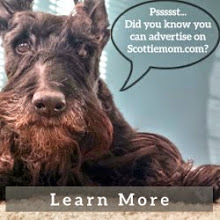 However, our work is not done, fellow Scottie Moms and Dads. Think of all the Scotties (and non-Scotties, of course) out there who might not get picked up by rescue groups. I must ask: if you don't have room in your homes to take in yet another Scottie, please help your local Scottie rescue by keeping tabs on the intakes at shelters around you (especially kill shelters) and being on the lookout for any Scottie sightings. Plus, if you can, set aside a few hours every month to volunteer your time or offer what monetary assistance you can to help give these poor animals (Scottie and non-Scottie ones alike!) a fighting chance. And remember: it's National Adopt a Shelter Dog Month so if you can give a pup that ultimate gift of a furever home, please feel free to do so! How many Scottie rescues do we have out there now? 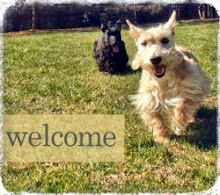 Feel free to share your Scottie rescue story in the comment box below. I thought I'd spice up this week's BlogPaws' Wordless Wednesday, a popular Internet practice of posting a photo on your blog that requires no explanation, by showing off Mr. K's premature holiday spirit. In this photo, Mr. K looks like he can give Dracula a run for his money on the spooktacular scale. Anyone have any idea what Mr. K was really doing when this photo was snapped? Cousin Snackle is not known to be the friendly type so you can imagine how extra careful Scottie Mom is with Mr. K's Scottie-tude hanging around Cousin Snackle's house. Over time, however, the two have learned to ignore each other and it is Heather who sounds off a nice little growl whenever Cousin Snackle gets too close for comfort. This last visit, however, we decided to try to get a canine "family" photo and see what we came up with. Much to my surprise, we were able to snap one - just ONE - photo that might be considered frame-worthy. I think poor Cousin Snackle was just too excited to cooperate and try to achieve more than one shot for the day. 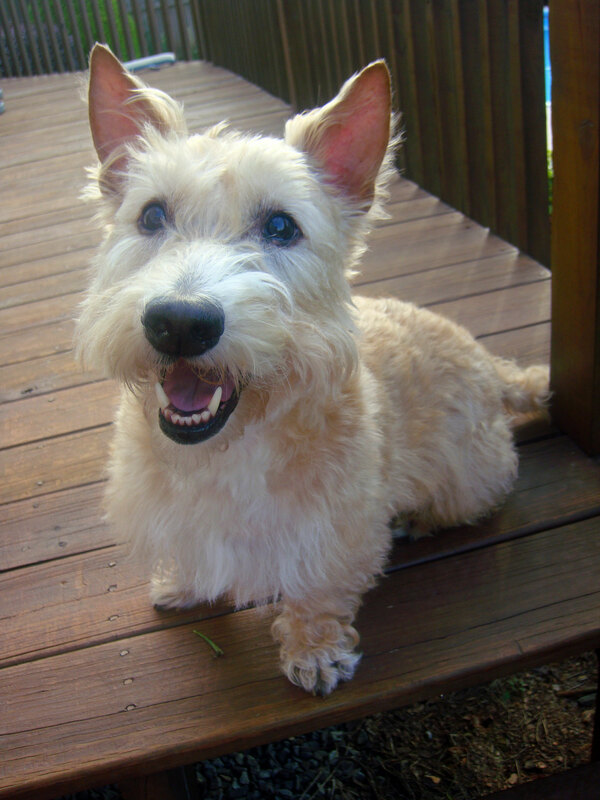 Mr. K and Heather's Cousin Snackle is probably one of the reasons Scottie Mom never really cared for dogs at first. He is extremely high maintenance as he is afraid of storms (which happen rather frequently in the humid Southern summers! ), absolutely despises UPS trucks, and don't you dare even get him started on male visitors. Not a former Scottie Mom ex-boyfriend went by that didn't disagree with Cousin Snackle at some point - then again, Cousin Snackle could have been onto something and was just trying to warn Scottie Mom, right? 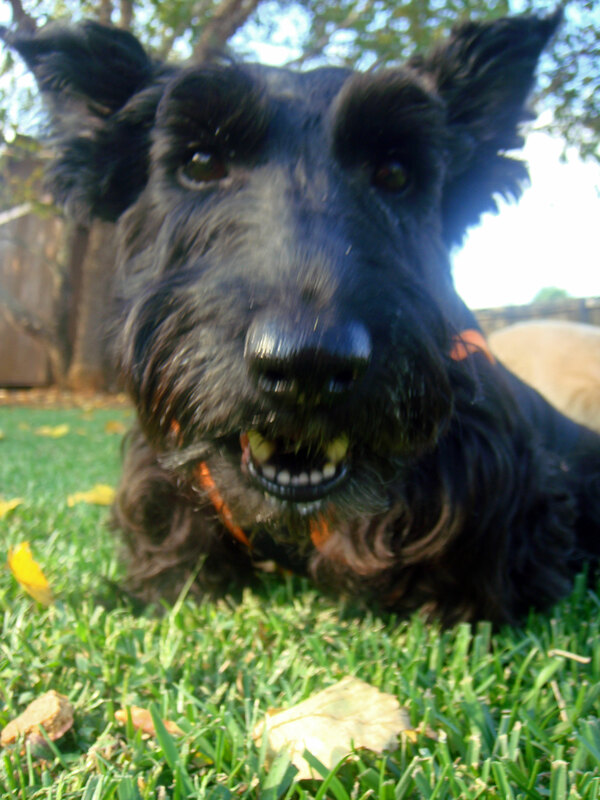 All that put aside, however, there is something within the spirit of a rescue pup pup that I think all the fellow rescue Scottie Moms and Dads can agree on: there is this unending love and eternal gratefulness that a rescue dog shows his or her owner, almost from the moment they come home. Cousin Snackle, despite his grumpiness towards others, is never shy in expressing his affection towards his primary caregiver, Scottie Grandmadre. What's more, he still jumps for joy when Scottie Mom's sister comes back to the house for some occasional belly rubs and play time in the yard. (After all, she is essentially his life saver!) And even though Cousin Snackle and I didn't get off on the right paw those many years ago, I certainly enjoy taking Heather and Mr. K up to visit him from time to time now that my appreciation for rescue animals has grown deeper. Stay tuned for tomorrow's post when Heather and Mr. K visit an adoption event to help some new rescue friends find furever homes! All aboard the Scottie train! Heather and Mr. K jumped onto a cabin of a stationary train while visiting their Scottie grandparents this weekend. We spent the afternoon checking out local shops and stumbled upon this great photo op for the pups. Located on Main Street in downtown Belmont, North Carolina, the train Heather and Mr. K boarded is a symbol of the town's trade roots dating back to the 1800s. Looks like these two got their paws dirty digging up a little history! It's that time again! Heather offered up this photo for BlogPaws' Wordless Wednesday, a popular Internet practice of posting a photo on your blog that requires no explanation. Here, Heather seems to be considering whether to ditch her favorite spot under the hooman bed for one more comfortable on top of it. What do you think she could say to convince Scottie Dad to let her have hooman bed privileges? It's 6:55 a.m. You know it's morning but you're hoping to get away with a few extra minutes of sleep. You keep your eyes closed and you might turn your body another way...you know, so the Scottie won't see. He does see you, despite your best effort, and he ignores you this one time, pretending he's still in sleep mode as well. After all, he understands: you're a Scottie Mom and you need your rest. He closes his eyes but he knows that it's time. Not more than 10 minutes later, he gets up, stretches, shakes off and lays back down, this time crawling his way toward you inch by inch, all the while remaining in a resting position. His tail wags, sticking straight up in the air and he's wearing the biggest grin as if to say, "Hello! I'm really happy to see you!!" This was Mr. K's ritual every morning when he used to sleep in my bed, back before I moved in with Scottie Dad. I never needed an alarm clock. He was always there every morning, eager for me to wake up but careful not to make me miss out on too much sleep. Last week, when Scottie Dad was away, Mr. K joined me a night or two on the bed (a Scottie Dad no-no) for the first time in about a year. Much to my surprise when I awoke that first morning, guess who had returned to his old ways, waking me up with a more excited spirit than ever? That moment melted my heart and all the logic Scottie Dad had instilled within me over the last year about the benefits of having one place in the household that was ours, and not the Scotties', went away. 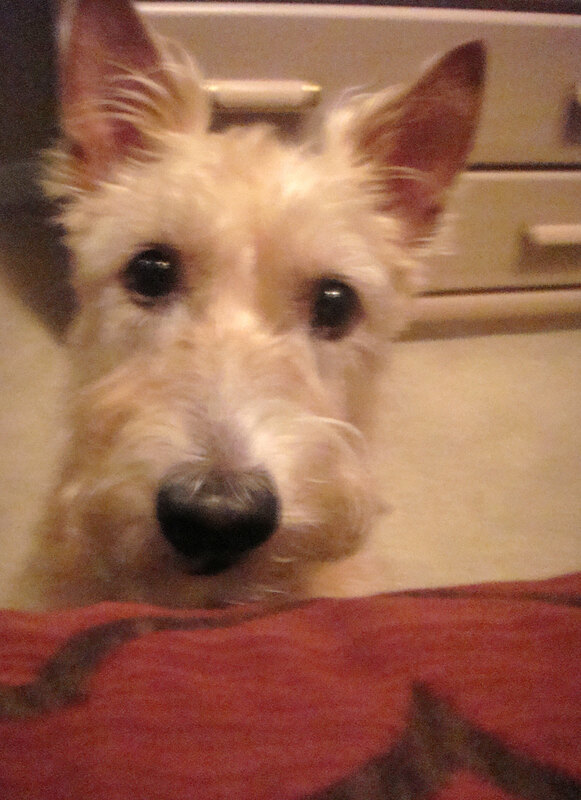 How on Earth could it be beneficial to not see this sweet Scottie face as I wake every morning? So, every morning he is with me, I lean over and say, "Hi!" being sure to plant a quick kiss on Mr. K's forehead. That's his cue to jump up and bound across the bed, making one giant leap off the edge, ready to start the day. My feet have barely touched the floor when out comes Heather, tail also wagging, of course, from her favorite spot underneath the bed. (I've tried to get her to stay with Mr. K and me but can only recall one or two nights in which she actually spent the whole night with us.) A couple quick pats on her back, she stretches and the three of us head to the kitchen to grab their leash and head out for our morning walk. Such goes a happy morning in the life of a Scottie Mom! 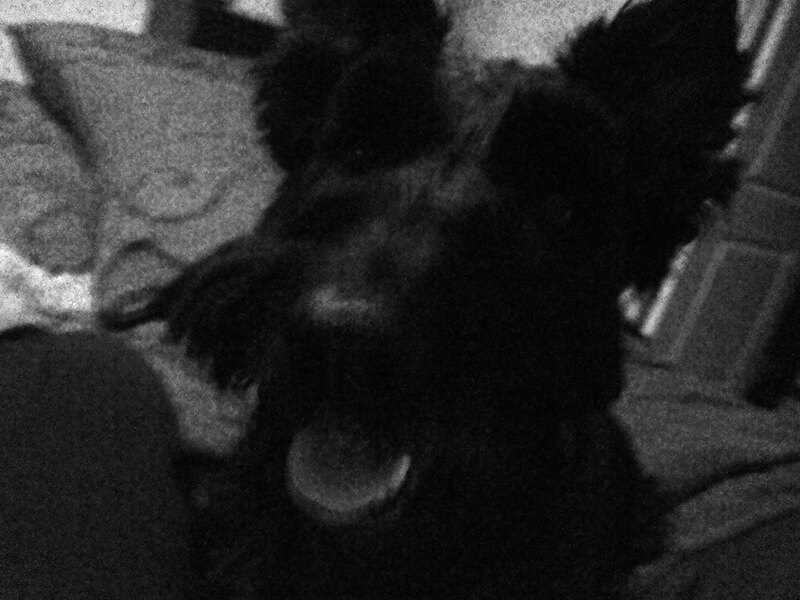 What's the secret to a happy Scottie Dad? No smelly dogs and a freshly groomed puppy! And so, while I was enjoying a facial at a local spa (courtesy of Scottie Dad), the pups visited the Petsmart down the road for a spa treatment of sorts themselves so they could be fresh and clean upon Scottie Dad's return home. Something tells me they didn't love their experience as much as I loved mine, though! Though I'm a fan of small and locally owned businesses, Petsmart has become my "go-to" place when I'm in between groomers (which, in actuality, seems to be all the time). As is the case with any groomer, my dogs hardly ever come out of there looking the same as they did after the previous appointment but the major disappointments have been minimal in the two years I've lived in Atlanta. Then again, this also could be because I have lowered expectations since I have yet to find someone who does the job right, time and again. Most of the time, they do a fair job and the price is reasonable - among the cheapest I've found in Atlanta so far. Anyway, Mr. K came out of this latest grooming session with a little bit of a Westie face and his precious beard chopped short. While he looks a little odd (and yet, cute as ever! ), I've come to terms with the fact that hair is just hair and it will eventually grow out in due time so to say I'm upset is certainly an overstatement. The one thing I cannot understand throughout my many Petsmart grooming trials is how all-over-the-place the ears always come out. One time, I swear Mr. K came out of the store with "dumbo ears" while Miss Heather's were perfectly shaven. Not sure how something like that happens but again, I don't really let it effect me because deep down inside, I realize that somewhere down the line, you're going to lose a certain level of quality and attention to details when you work with big retail stores like this. The one thing I do need to hand over some serious props to Petsmart for, though, is the ability to get the pups clean and keep them smelling like that! I don't know what products they use or what they do differently, but nine times out of ten my dogs stay smelling fresher longer when they're groomed at Petsmart versus any of the smaller grooming facilities I've tried. (Of course, we haven't made the rounds to all the places here yet so give us some time to check the others out before I can officially make that claim!) All grooming judgement temporarily aside, however, I must ask my fellow Scottie Moms and Dads: is it worth learning how to groom a Scottie yourself? Or, would you say paying to get your Scottie professionally groomed is worth every penny?